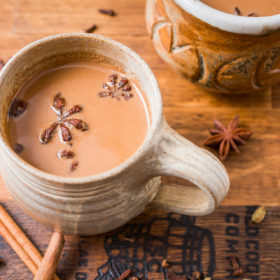 Grenache, brandy, Cointreau and whole spices add welcoming warmth to this holiday drink, courtesy of Nightingale in Minneapolis, where they know the cold. 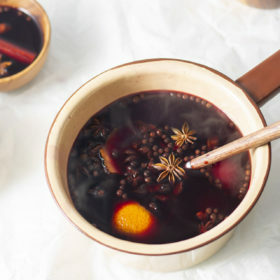 Carrie McCabe-Johnston, co-owner of food and cocktail lounge Nightingale in Minneapolis, has included mulled wine on her winter menu since 2013, and has seen its popularity grow. “I had a woman call in October to see if it had hit the menu yet. 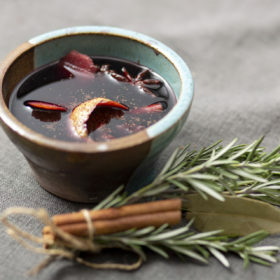 It gets so cold in Minneapolis in the winter months that [mulled wine] is a perfect warming drink, ” McCabe-Johnston recently said on a day when the temperature was -13°F. Simmer all ingredients together about 15–30 minutes, until well-seasoned and flavored. Strain before serving.